Soccer (or football outside of America and Australia) is a very well-known and popular sport all around the world. To play soccer at its most basic, all you need is a ball to kick around on an empty field with some goal posts, and several friends to play on opposing teams, or you can look around your local community to join an established soccer team. 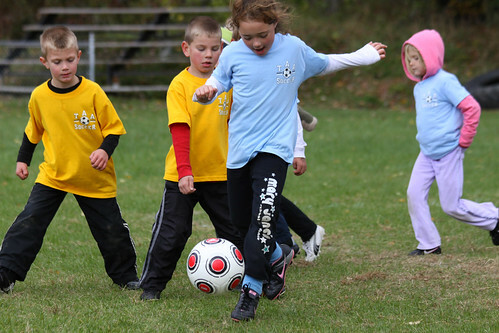 With lots of high-intensity running, soccer is bound to keep off the pounds and keep you enthusiastic about playing. Ultimate (formerly known as “Ultimate Frisbee”) is a sport not unlike American football and soccer. The difference is that a throwing disc is used by opposing teams to score a goal at the end zone, and players must throw the disc without traveling, much like the rule in basketball. Ultimate may appeal to players who aren’t into the more mainstream sports of baseball, soccer and basketball, as the throwing disc behaves much differently than a ball. Despite the “nerd factor” of the throwing disc, there is still plenty of hard running and teamwork involved to make the sport challenging and fun. Ultimate has a small but dedicated following, an official governing body, and it isn’t hard to find a local team or to even start your own. Weightlifting involves training the body primarily for strength with weights. While this sport is not cooperative like all the others, it cultivates a self-discipline that is required to keep pushing oneself to lift heavier and become stronger. The serious nature of this sport makes it perfect for introverts and “serious” types alike. At its best, weightlifting can be very motivating and exciting, especially when one notices marked improvements in their strength. Softball is another popular sport played in America and many other places in the world. It’s similar to baseball, but the most obvious difference are the pitching styles and the size of the ball. Local teams are often formed by companies, businesses, school and church groups, and more, so anyone young or old can join a softball team. The sport isn’t as intense as the previous ones, but it’s much better than sitting around and not having any fun. While not as popular as it was in its heyday in the mid 1980’s, racquetball is still played by millions today. It involves a hollow rubber ball that is considerably lighter and bounces further than a tennis ball, and a specific type of racquet different from that of tennis, and is often played at indoor courts. This allows participants to get all the exercise and fun they want without having to worry about the weather. The rules are different from tennis, and there can be a great deal of running involved, which can make this sport intense and challenging, but fun. About the Author – Christine Jones is a health conscious individual and lives an active lifestyle. On her free time, she enjoys writing for wellbeing-support.com.